Ok so maybe that's a reach but after qualifying for their Freeman Beauty VoxBox and not being able to find it here or in the city closest to me I was frustrated and let them know. Today I got a box of both of the products I could have gotten and I heart them both. 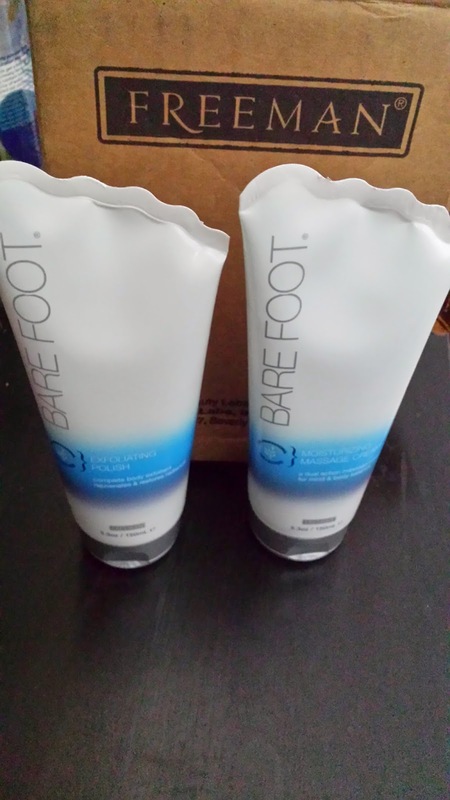 As always Influenster provides products free as long as we review them. Look over in my side bar if you have never heard of them and click the purple button. Always full size products and they are normally things you are interested in with some that will expose you to new things. So I got a bottle of the exfoliating cream and the moisturizer as well. I'm a sucker for a good exfoliation so that is my favorite so far but I know I wouldn't have to do that as much if I moisturized better all over so I need to step up my game with that as well. Both smell fantastic though really. Nothing overpowering, almost powder like. I love it, not sure if others will but it's a nice clean light scent. Be sure to check it out if you can find it nearby. Awesome!!! I've never heard of Influenster. Off to research them now. Yes, looking forward to the review. If they want you to wait for an invite let me know and I'll send you one. It's just free stuff which I love once you get used to reviewing and posting. And because the box was originally a coupon for one of these products if you can find it near you I'll send you the coupon. Can't find it here so it's just hanging out in my bag.